This weekend I got the chance to go back to my normal routine; I had time to make a meal plan, go to the farmers market, etc. I was just itching to try some recipes from my vacation in Greece and this was the at the top of my list. On my first night in Greece, after I had settled into my hotel room and walked around the neighborhood a bit it was about 10pm and I was hungry. I found a nice looking taverna with sidewalk seating so that you could sit down, relax and watch the world walk by. Luckily the taverna had quite the menu and I made sure to look at everything on it before ordering. I recognized most of the dishes on the list and I wanted to try authentic Greek versions of all of them. I got to the section on pies and I saw the spinach pie and the cheese pie, both of which I was familiar with, but there was a third pie in the list, a pumpkin pie. This was the first that I had heard of a Greek pumpkin pie and it was under the meal section not the dessert section so I could only assume that it was a savoury pie rather than a sweet pie. Unfortunately, when I tried to order it I was informed that that section of the menu was no longer available, I guess by 10pm they are only serving the dinner part of their menu. Oh well, not to worry, since it was my first meal in Greece what better place to start than a gyro, preceded by some tasty saganaki? I never did get to try a Greek pumpkin pie in Greece but as soon as I got home I looked it up on the web and I found this recipe for a pumpkin pie or kolokithopita . This is a nice and simple recipe where the filling is simply pumpkin puree, feta and some eggs to bind, all wrapped in crisp and crunchy phyllo pastry. The original recipe called for rolling the phyllo dough up around the filling but I decided to go with more of a pie shape. I also threw in some fresh sage because I had them on hand. The savoury pumpkin pie turned out pretty good! I really liked the way the sweet pumpkin paired with the salty feta cheese. I enjoyed the pumpkin pie warm the first day and straight out of the fridge the second day and it was good both ways. I am thinking that a sweet pumpkin pie would be really nice cooked in a phyllo dough crust as well. Mix the pumpkin, feta, eggs, pepper and sage in a bowl. Repeat until you have 6-8 layers depending on how thick you want the crust. Place the pumpkin mixture on top of the phyllo dough. Brush the top of a sheet of phyllo dough with olive oil and place it on the pumpkin filling. Pumpkin with feta – I can’t even imagine the taste of that combination in my mind. I love anything with pumpkin and I love savory more than sweet, so I think this would be right up my alley. What a great recipe! It looks delicious as well. There is a Serbian version of this pie but it’s sweet, uses fresh squash (usually pumpkin), and is sometimes flavoured with cinnamon. Your recipe also looks quite delicious and I can’t wait to try it. that is something different! what a combination with pumpkin and feta! i would have never of thought to combine those two! Kevin, often the menus in Greece are a reflection of all the dishes they offer throughout the year. Sometimes the ingredient(s) are not available or not in season. This likely was the case with your kolokithopita. this looks heavenly–savory pumpkin sounds wonderful. 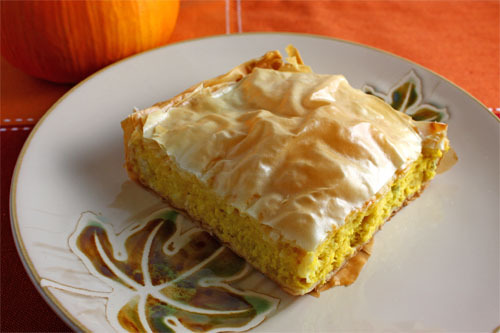 I had never heard of a Greek pie recipe using pumpkin, but your description convinces me that it would be nothing but delicious! I love your thinking here Kevin; thinking outside the box. Gosh this so good. It gotta taste good! Pumpkin in a pie! look interesting!! I want to try out your recipe!!.Thanks! Lol Kevin! I was waiting to see another of those corn recipes you had in store for us! You finally broke the chain of corn. ! This is refreshing- a pumpkin pie- I love all baked goods! a savory pumpkin pie w/feta? yum! i may actually try the rolled up version! i like that you have a fall plate and pumpkin. very cute. I am waiting for this one, I can totally serve this for one of Thanksgiving dessert. What do you think? Never knew they had a Greek pumkin pie. It looks great. A delightful pie! Pumpkin and feta cheese go well together! Yummy! i loveee savory pies! excellent idea for halloween…but i’ll probably try baking the sweet version first. it failed me many times! Neat departure from the typical spinach and cheese pies. Sounds easy and delicious! I’ve never saw that lind of pie in Greek menus either, but I think I am going to try it, sounds very nice. Looks pretty good for a combo like this. Never heard of that before. Hi Kevin…that sounds very very good…I will have to share one of my favorite recipes with you…it is so so good and I think you will like it….I will try to make it and post it soon!!! Feta and Pumpkin is interesting. I can’t wait to give it a try. I’m on a pie hunt right now. I’d love to see how your sweet pumpkin and phylo dough idea comes out. I’m still new to the dough area of baking, new as in I haven’t mastered it not even close. That’s so funny how you guys (ie Americans) eat your pumpkin sweet! I am a vego and use pumpkin as the basis of many meals – curries, risotto, soup, pasta, salads, etc…, including one of my favourites – Greek pumpkin and feta pie! My version is similar but has spinach in it too, just add it near the end to briefly wilt. pumpkin and feta is a great combinaiton. having it in a cake is even better! Now this sounds so different than anything I’ve eaten lately. It looks delicious! Great to see you back Kevin with some more fabulous recipes. I love your pumpkin pie it looks so good. I love pumpkin, but have only used them in soups or curries. Interesting, that actually sounds pretty good. The Greeks are geniuses with pairing fruit and feta, I think they’re the ones who came up with that (now trendy) watermelon and feta pairing as well. I love pumpkin in its sweet incarnations, so I’d love to try a savory pie! This is very nice looking! Cheese sells me on almost anything. Looks like a great texture, and I love your plate! First time I hear of a Greek pumpkin pie. Looks great for the upcoming Thanksgiving! wow, that is very interesting… i bet you could use that filling in little pie shells as an appetizer, too! Something else that I’ve never heard of!! I can see why you would want to come home and find a recipe for it, though – it sounds so delicious! Interesting… but every time I use phyllo sheets, the top layer tends to dry out, and get wrinkled and soft after a few minutes. Brushing with oil has not helped… how did you overcome that? First time here, lovely blog. Love this twist on pumpkin pie. Definitely going to try this soon! Interesting flavor combination. I love pumpkin and feta so I am sure I would like it. It’s that time of the year and everything pumpkin is in style. Can’t wait to try this one. What a great flavor combination. You keep making me want to travel to Greece more and more! Pumpkin and feta…never would of tried those two together but it sounds amazing!! I will have to join the ranks of never would have thought to combine pumpkin and feta, looks good. This is perfect for Fall. Elra: As a savoury pie I would imagine that it would go better as an appetizer or a side dish. A sweet version would be great as a dessert! anudivya: Phyllo dough seems to be pretty temperamental to work with. It seems to work best if you thaw it over night and use it right away. I have found that when I use phyllo dough that has been previously thawed and frozen again it does not tend to work out as well. This sounds wonderful for fall! I was just at my inlaws house for lunch yesterday and was looking through their Greek-American church cookbook for recipes. I found a meat pita that sounds pretty interesting. Wow, this is a new one for me. How very interesting. I would love to try this! this really makes me wanna try some greek pumpkin pie too! and savoury…must be interesting! simply amazing.. love the idea of pumpkin pie, i’ve never had it:-( the pic is so lovely..
Pumkin pie with feta…..Hope you saved me some?! Looks lovely. Sounds interesting!! I can’t imagine the taste of it …hmmm.. This looks amazing. I love greek food and have never heard of this before. I’m going to have to ask my neighbor about it. Kev anything with feta and phillo wins my heart! Looks absolutely delicious! This is interesting, I never heard of this… Looks great! This looks divine. Of all your fine recent posts, this one is especially hard to resist. Never heard of this before.. Welcome back! I like the sound of this one Kevin! I think the feta must have complimented the pumpking beautifully. I’d never heard of a kolokithopita or any savory style pumpkin pie before. I’ll have to try it out. I’ve been going on a pumpkin frenzy lately and always looking for something new to try–I love the sound of this! Made this for dinner last night using pumpkin from the local farmer's market. Very easy and delicious. I liked the addition of fresh sage. I do think it needed a bit of salt, even with the feta, so next time I'll add that.